Picturecrossing: The Blog: The SX-70 ND Filter solution! The SX-70 ND Filter solution! Each of these are a perfect option for those of you not wanting to spend a hundred dollars to send your precious SX-70 off to someone who will tear her apart to try to modify it for 600 film. 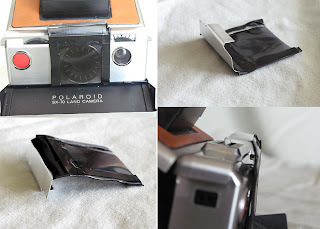 Or trying to attach those flimsy ND film filters to each film pack - only to have it spit out half the time. You just attach the filter to the flash holder and shoot away. Then just take it off when you're done. It's that simple. Filter#1 =$ 45.00 - Polaroid SX-70 Accessory Holder with hand-cut ND4 plexiglass filter. Filter #3 - $30.00 - This is a hand made accessory holder (using aluminum and electrical tape) with the ND4 Plexiglass filter cut and sanded to fit. (Please do not fool yourself into believing that my hand made accessory holder is going to be some precise, machine-tooled beauty. I'm by no means an engineer of any sort. But this is a simple and cheap, if ugly and flimsy, solution. eMail (lance@lancephoto.com) or Flickr Mail me for info or to order. PayPal is preferred but I can also accept Money Orders. I am custom making these so please allow at least 5 days for production time before they are shipped.